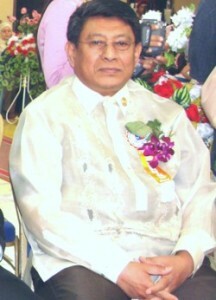 Datu Alexander Lucman organized the Federation of Maranao Associations in Saudi (FEMAS) in 1995 with the support of some prominent Maranao leaders in Riyadh. Datu Lucman has been very instrumental in uniting the maranao community in Saudi Arabia, particularly in Riyadh by organizing FEMAS. At least 20 maranao associations supported his ambitious plan by affiliating with it. Before putting FEMAS into realization, Datu Lucman had been very active in promoting the social and economic welfare of not only the Maranaos but the entire Filipinos in the Kingdom of Saudi Arabia. He has been in the Kingdom for several years but his popularity and good image have never been tainted due to his being approachable, friendly, and helpful fellow in addition to his being religious. RIYADH, 27 March 2007 – Filipinos expatriates, mainly from the Lanao and Maguindanao communities, gathered here yesterday to express their sentiments and pay tributes to the ‘ama’ (father) of the Muslim Mindanao community, Dr. Alexander Lucman, and to bid farewell to the family who are returning to the Philippines. Lucman, an engineer by training, has been an outstanding advocate for Filipinos in the Kingdom and has worked with the Saudi Ministry of Economy and Planning for the past 25 years. He has been also the BOD chairman of the Internaitonal Philippine School in Riyadh (IPSR). In an emotional wording by the master of ceremony Wawi Mabaning, who could not hide his sadness, said that it is sad when somebody leaves a family but it is more painful when the head of family must move on. The farewell party was organized by the Integrated Mindanao Economic Forum (IMEF) and the Federation of Maranao Associations in Saudi (FEMAS) and hosted by the International Philippine School in Riyadh (IPSR). Lucman obtained his doctorate in engineering from Cairo and has been described as humble, modest and man of simple tastes by his friends and compatriots. Lucman told attendees yesterday that he turned down two offers to become Philippine Ambassador to Saudi Arabia in the past, choosing instead to work even closer to the Overseas Filipino Workers (OFWs) in the Kingdom by founding the Union of Muslim Associations (UMA) and FEMAS. He is also one of the founders of the Integrated Mindanao Economic Forum (IMEF), which was organized recently in Riyadh. Lucman and his family were able to utilize their relationship with some members of the Saudi royal family to render services to OFWs here, especially for serious medical treatments. He once fought for the rights of 31 OFWs who had not been paid in seven months. Lucman has been an advocate for the rights of foreign workers ever since before the Philippine Embassy was established in Riyadh in 1982. Lucman once helped stranded students who traveled to Riyadh without prior approval by universities here. And because of his effort on this matter the 21 students were approved and another 20 scholarships were allotted for Muslims students from the Philippines. Expressing his sentiment on the occasion, Dr. Omar Mababaya, IMEF spokesman and chairman of the group’s board of trustees, said that Lucman’s long professional history is a testament to his virtue. Kaka Alex had he not gained the trust and confidence of his superior, he said. He would not have been there for a very long period of 25 years! This reflects not only his positive contribution to the Kingdom’s development, but also his ideal personality as a trustworthy person, Mababaya added. Regarding his role as the leader of the Muslim Mindanao community in Riyadh, many have over the years greatly benefited from the work of Kaka Alex and his wife Rohanie. Above all these, I do respect him for being patient in times of crises. Leadership, trustworthiness, helpfulness and patience comprise Alex’s core 25-year legacy of a very fruitful and memorable stay in Saudi Arabia, Mababaya added Saidali Malic, purchase manager of Riyadh Turf described Lucman as a highly motivated and politically oriented person who has worked for the preservation and conservation of the Bangsa Moro pride, rights and freedoms. Usodan Dida-agun, purchasing manager for Mitsubishi Electric, Riyadh described how the Lucman family has helped Filipinos obtain medical treatment. Their connections to the royal family have helped many parents who could not afford the long hospitalization of their seriously-ill children or kids with birth defects. I have contacted Dr. Alex and Ate Rohanie at least twice in arranging a recommendation from the Kingdom’s leaders for the hospitalization of some Filipinos. FEMAS Secretary General Saleh Bucay called on Gloria Macapagal Arroyo to appoint Lucman as the next Philippine Ambassador in Riyadh. He is pious, approachable, and a humble person that despite of his financial ability to own a luxurious car, he never got one, he said. Most of the community leaders have expressed their best wishes to the Lucmans in their final decision to settle at home for the next chapter in their lives.